With headlines full of stories about big nuclear buttons, false missile alarms, and rising conflict and famine in many parts of the world, it might seem that the obstacles facing us are greater than ever as we begin a new year. But WILPF is not daunted—we are pushing powerfully into 2018. We have joined a delegation of women experts representing feminist peace movements from across the globe at the Vancouver Foreign Ministers’ Meeting on Security and Stability on the Korean peninsula on 16 January. Together with Women Cross DMZ, Nobel Women’s Initiative, and Canadian Voice of Women for Peace we are urging comprehensive peaceful resolution to the longstanding conflict through diplomacy and dialogue—and reminding the foreign ministers that working with women’s movements is essential for lasting diplomatic solutions. January also marks the anniversary of the historic Women’s March on Washington when millions of women marched and demonstrated in the name of change and feminist peace, despite growing militarism, nationalism, and gender injustice. This year’s Power to the Polls event in Las Vegas on 21 January is a response—through solidarity and positive action—to the horrific violence that ripped through that city just a few months ago. In many other cities, we will take to the streets again this weekend, louder than ever, with the message that we are tired of patriarchal men with buttons controlling whether we live or die; of watching money being wasted on the tools of death; that it’s past time to #DisarmPatriarchy; that we demand a #FeministPeace. You should too. As Oprah Winfrey commented in her electrifying speech at the Golden Globe awards: “What I know for sure is that speaking your truth is the most powerful tool we all have.” Let’s go speak our truth. The US Department of Defense is currently concluding a review of the United States’ nuclear policy, which is to be released at the end of this month. A “pre-decisional” draft of the nuclear posture review suggests the use of nuclear weapons could be considered in response to non-nuclear attacks “that caused mass casualties” or were “aimed at critical infrastructure or nuclear command and control sites”. The draft also calls for the development of two new types of nuclear weapons: a “low-yield” warhead for its submarine-launched ballistic missiles and reintroduce submarine-launched nuclear cruise missiles. There is also no reference to Article VI of the NPT in the new US Nuclear Posture Review. This is consistent with the US positions in the General Assembly last October, written into revisions of the annual Japanese resolution on nuclear disarmament, which backtracked on all previous disarmament commitments and NPT agreements (see pages 6–7 of the First Committee Monitor, 2017 No. 4). While these changes lower the threshold for the use of nuclear weapons and increase the possibility of nuclear war, it is also important to consider the continuity of US nuclear policies. The vast nuclear weapon and infrastructure modernisation programme began under the Obama administration. The policies and practices that put us all at risk have been in place since the 1950s, as Daniel Ellsberg’s latest book The Doomsday Machine clearly shows. It is the entire nuclear monolith, rather than just these terrible new policies, that must be resisted and challenged in significant ways over the coming years, including through the entry into force and implementation of the nuclear ban treaty. 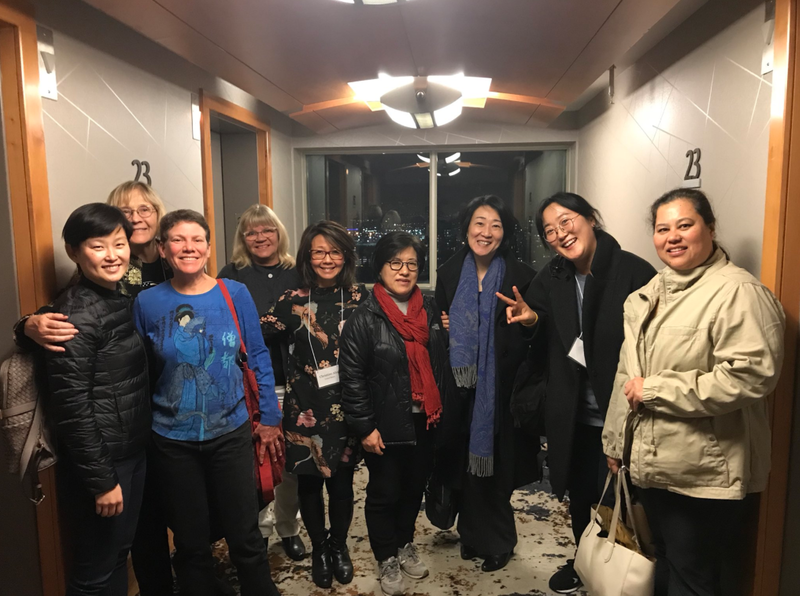 WILPF joined Women Cross DMZ, Nobel Women’s Initiative, and other women’s peace groups as part of civil society delegation at the “Vancouver Foreign Ministers’ Meeting on Security and Stability on the Korean peninsula,” which took place on 16 January 2018. The meeting was co-hosted by the United States and Canada to “demonstrate solidarity in opposition to North Korea’s dangerous and illegal actions and to work together to strengthen diplomatic efforts toward a secure, prosperous and denuclearized Korean peninsula.” Certain aspects of the meeting, such as the opaqueness of the agenda and the list of participants, have sparked criticism from certain countries. China and Russia, as well as peace groups, have raised concerns about the involvement of only UN Command troop contributing countries to the Korean War. WILPF was represented in Vancouver by its international president Kozue Akibayashi. Key activities taking place alongside the ministers’ meeting included a day-long women’s forum discussing peace and security on the Korean peninsula. The women’s groups released a statement on 16 January, encouraging the ministers to “prepare the table for peace”. Earlier this month WILPF signed a letter from multiple women’s organisations calling for participation in Vancouver, while in December WILPF Secretary General Madeleine Rees and RCW’s Director Ray Acheson wrote an op-ed about preventing nuclear war. 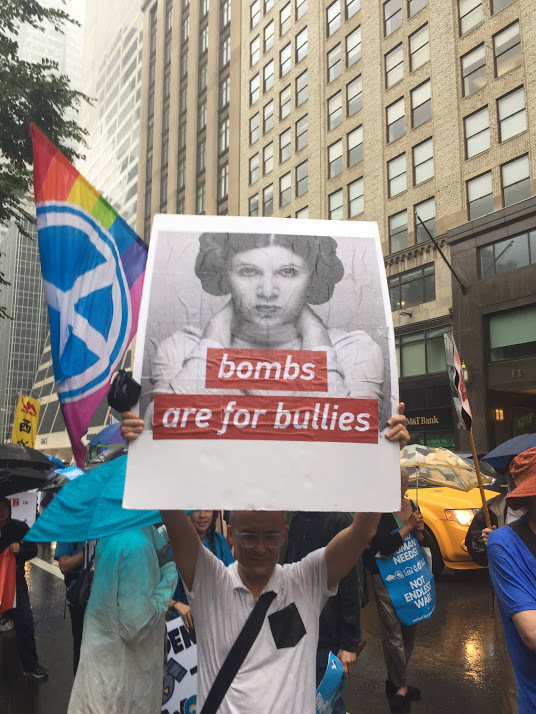 We wanted to bring news about the nuclear ban and ICAN’s work to Canadian students to encourage renewed activism against the bomb. So Ray Acheson is visiting a few universities this month to talk to students and faculty about global activism and diplomacy for the treaty. In April and May, we’ll also be bringing the ban to some US universities, including Princeton University, The New School, and Wellesley College—stay tuned for details! As usual, Reaching Critical Will is going to be covering many disarmament meetings throughout the year. We'll be taking on nuclear weapons, autonomous weapons, the arms trade, and more. Here is a quick look at what’s up in the next few months. The second Preparatory Committee for the 2020 Review Conference on the Nuclear Non-Proliferation Treaty (NPT) will take place in Geneva from 23 April–4 May 2018. This is the first NPT meeting to take place after the adoption of the nuclear ban treaty in July 2017 and will be a good opportunity for states and civil society to address the best ways that the new prohibition can inspire concrete disarmament action. Reaching Critical Will is the civil society coordinator for this meeting; we will alert everyone through this email list when registration opens for the conference. We will also maintain a calendar of side events and facilitate civil society interventions. On 14–16 May 2018, the UN General Assembly will hold a high-level international conference on nuclear disarmament in New York to review progress made. It will hold an organisational meeting on 28 March to prepare. This high-level meeting will be a key opportunity to promote the nuclear ban treaty and encourage governments to join the treaty and take real action for disarmament. Reaching Critical Will is the civil society coordinator for this meeting; we will alert everyone through this email list when registration opens for the conference. We will also maintain a calendar of side events and facilitate civil society interventions. 2018 is the year of the Third Review Conference of the UN Programme of Action (UNPoA) on the illicit trade of small arms and light weapons (SALW). A Preparatory Committee will be held in New York from 19–23 March 2018, while the Review Conference itself will be held 18–29 June 2018. For WILPF one of the main goals of the conference will be to elevate the gender analysis of the UNPoA and small arms initiatives. The International Action Network on Small Arms (IANSA) is the civil society coordinator for this meeting. Registration is now open for the PrepCom and the RevCon. The next round of the Group of Governmental Experts on Lethal Autonomous Weapon Systems will meet in Geneva from 9–13 April 2018. It will continue its work later in the year from 27–31 August 2018. During these meetings, governments will further their discussions on autonomous weapons, hopefully with the aim of pursuing legal and political responses to prevent their development. The Campaign to Stop Killer Robots will be active at these meetings, calling for a new legally binding instrument to prevent the development of these weapons; Reaching Critical Will will provide reporting and analysis as at past meetings. The Fourth Conference of States Parties to the Arms Trade Treaty will take place in Tokyo from 20–24 August 2018. The last CSP in 2017 was disappointing, with states continuing to focus more on procedural arrangements for conferences than on the problems posed by arms transfers that are resulting in violations of human rights and international humanitarian law. Reaching Critical Will’s work on raising awareness of how to prevent gender-based violence through the implementation of the ATT will continue ahead of this meeting; we will also provide reporting and analysis as at previous years. Diplomats from the disarmament delegations of Austria, Brazil, Ireland, Mexico, New Zealand, and South Africa, and Ambassador Elayne Whyte Gómez of Costa Rica, received the highest number of votes in an online poll to determine the"2017 Arms Control Person(s) of the Year” in recognition of their efforts to secure the historic 2017 Treaty on the Prohibition of Nuclear Weapons. The largest Dutch pension fund, the civil servants fund ABP, has decided to end its investments in producers of nuclear weapons. The ABP was under increasing pressure since last summer, when the international treaty banning nuclear weapons was adopted in the United Nations. The pension fund recognises that this global ban on nuclear weapons was decisive in its decision. Norway will exclude investments in BAE Systems, AECOM, Fluror Corp, Huntington Ingalls Industries, and Honeywell because of these companies’ involvement in the production of key components for nuclear weapons. In December 2017, the Ottawa Convention banning anti-personnel landmines reached its 20th anniversary, which was marked by events and activities around the world. Also in December, countries met for the treaty’s sixteenth states parties meeting (16MSP) in Vienna, where they condemned any use of landmines and in a declaration published at the end of the meeting. Palestine announced its country’s decision to join the Treaty and subsequently deposited its instrument of accession on 29 December 2017. Palestine became the 164th state party to the Mine Ban Treaty, following the accession of Sri Lanka earlier in the month. A recent New York Times article noted that “the world is rolling backward, and at a disturbingly faster pace, in the struggle to limit carnage from landmines and other booby-trap explosives.” Known casualties that year came to 8,605, including 2,089 deaths, according to a new report by Landmine Monitor, a research arm of the International Campaign to Ban Landmines. The toll was nearly 25 percent higher than the 6,967 maimed and dead counted a year earlier, and more than double the 3,993 in 2014. More than 15,000 civilians were killed by explosive weapons in 2017, a jump of 42% in a year, according to a global survey compiled by Action on Armed Violence. The rise—driven by airstrikes, which killed almost double the number of civilians in 2017 compared with the previous year—coincided with US-led military operations to reclaim the Islamic State strongholds of Mosul, Iraq, and Raqqa, Syria. A Federal Court judge has rejected the Trudeau government's attempt to sink a fresh legal challenge of the $15-billion sale of weaponised armoured vehicles to Saudi Arabia. Ottawa will be forced to shed light on what happened in the summer of 2017 when Canadian-made armoured vehicles were filmed and photographed taking part in a fight between Riyadh and residents of the Saudi kingdom's Eastern Province. The new lawsuit is the second being brought by University of Montreal law professor Daniel Turp. In January 2017, a different Federal Court judge rejected his lawsuit, noting there was no evidence demonstrating Canadian machines had been used against the civilian population. That decision is still under appeal. The deal that was opposed by Prof. Turp was brokered by the Harper government but it was the Trudeau government in early 2016 that sanctioned the export of the armoured vehicles. A new report from Chatham House outlines the increasing vulnerability of nuclear systems to cyber attack. The report says that part of the reason for this is failure to keep up with fast-moving advances, lack of skilled staff, and the slowness of institutional change. Worryingly, the threat does not receive adequate attention from those involved in military planning and weapons procurement. It would appear that the 2015 Joint Comprehensive Plan of Action (JCPOA) could come apart by in just a few months time. United States president Trump has waived a raft of sanctions against Iran as required under the agreement, which keeps the US within the deal for the time being, but the US president warned European allies and US Congress it will be the last such waiver he signs if they fail to agree to radical changes. The next sanctions waivers fall due on 12 May. The president laid down conditions for signing those that former diplomats involved negotiating the deal said were all but impossible to meet.